Central asian shepherd is not the dog for everyone. They can be dominant, playing deaf:) and protective of family-property . might be the right fit for you. Shipping is available. We have puppy parents on premises,you re welcome to come meet us . Our dogs are true to breed standard.We are interested in conservation of breed unique temperament and look, we are not creating fashionable dog with 200 lbs body, with lack of pigmentation, droopy face and sick movement. Our site was analysed by Vetary among top Central Asian Shepherd breeders and cross referenced positive social mention data with top analytics platforms. Our site was a clear winner with U.S. pet owners over the last 12 months. For context, Vetary awards breeders with best-in-class online buzz, content, visuals, and most importantly, a strong cause and devotion toward their breed of dogs. Stepping on the soft paws, he is right behind you. You turn around - and here the confident animal, it is impressive size and frightening calmness. It is likely, he will not rush: perhaps, strong "roar" - and this would be sufficient. If you are a stranger, you are no longer can amke a step. The majestic Central Asian Shepherd even at photos is an inspiration to respect and even more, in person. Central Asian Shepherd Dog - confident, fearless guard. For centuries, the character of these dogs tempered in fights with ferocious wolves. Meet our beautiful, award winning Central Asian Shepherd Dogs Alsu, Aya,and Safar! Got Central Asian Shepherd Questions? How much do they eat? What happened to their ears? Do they shed? We have all the answers for Central Asian Shepherds! Would you like a Central Asian Shepherd puppy of your own? Apply online now to reserve your puppy from our 2017 litters! The Central Asian Shepherd Dog (CASD) is one of the most ancient breeds of dogs. They were formed as a breed from natural selection more than four thousand years ago in the vast territory regions of Central Asia. 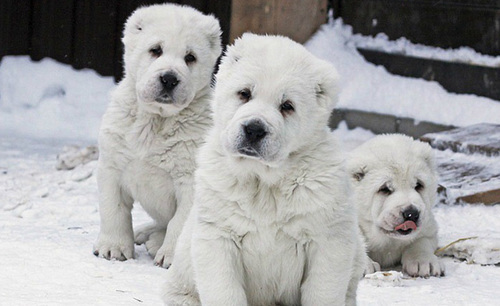 The native breed called "Alabai" historically common among central Asian peoples. Selected for their abilities to destroy predators, and praised for their power and stamina, Central Asians used these dogs as livestock guardians and later have transformed them into the working dogs for personal protection use or a “Guardian Dog”. The Central Asian Shepherd Dog is a protective dog who, as a puppy, bonds first to its human caretakers and next with its perceived possessions. Bred to solve problems, the Central Asian Shepherd Dog is independent minded, strong, brave, and responsible. It is a large but agile dog, sometimes described as a cat in dogs clothing. 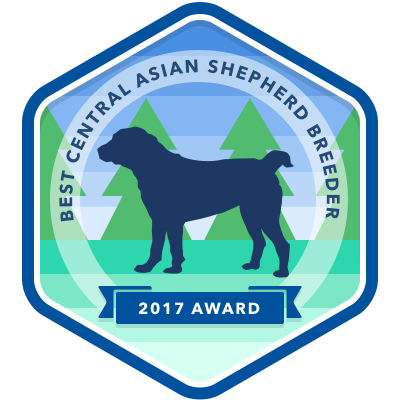 Today, in The United States, the Central Asian Shepherd breed has been recognized by the United Kennel Club in the Guardian category. you want to breed dogs?